"Move over Babe, the Red Sox are American League Champions." 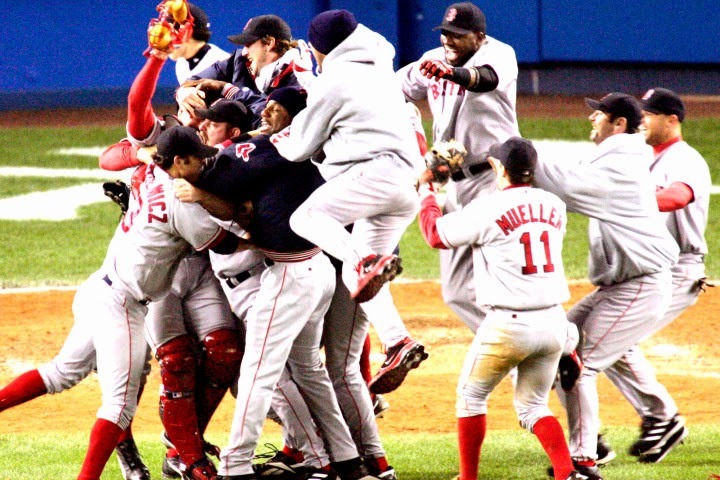 10th Anniversary of the 2004 ALCS. Game 7. October 20th, 2004. The Red Sox and Yankees were playing Game 7 of the ALCS, a series that had Boston three games down... and now, for the first time ever, a team being 0-3 forced a Game 7. The tension was obvious, the rivarly was at its best, the Yankees were desperate and the Red Sox were inspired. Game 7 was the ultimate rivarly experience between the Red Sox and Yankees, and Boston needed and inspiration boost to continue, so they gathered around in the Yankees clubhouse and watched the movie "Miracle". On the other hand, the Yankees had Bucky Dent to throw the ceremonial first pitch. Both teams were nervous, but only one was ready to win it all. The pitching matchup was Derek Lowe for the Red Sox and Kevin Brown for the Yankees. In the first inning, Johnny Damon singled and stole a base. Minutes later, Manny Ramirez singled but Damon was thrown out at the plate... It was barely the first inning and things already went wrong. The Red Sox Nation felt that they've watched this movie again, so they only hoped that the Yankees didn't outduel them by many runs, until the Large Father came to the batter box. As I wrote before, David Ortiz wasn't "The King of Clutch" back then and the legend of Big Papi was barely beginning. Frustrated by losing a runner at the plate, the Red Sox hoped that Ortiz could do something about it and oh boy, yes he did... Big Papi hammered Brown's pitch and sent it straight to right field. Gone. 2-0 and it was barely the first inning. Brown's issues continued in the second inning when he loaded the bases. Yankees Manager Joe Torre didn't waste time and pulled out Brown and brought it Javier Vazquez to face Johnny Damon. Baseball is a weird sport, where second chances do not always show up, but Damond had a chance to redeem being thrown out at the plate in the first inning. Boom. Grand Slam. Second homerun of the game at it was barely the second inning. The Red Sox had a 6-0 lead against the Yankees and there were still 7 innings left to play. In the fourth inning, Damon came again to the plate and the caveman hitted another homerun, giving the Red Sox an 8-0 lead. Meanwhile, Derek Lowe came up clutch with only two days of rest (hello, Kershaw) and onlly allowed a run in six innings. Good times never seemed so good. 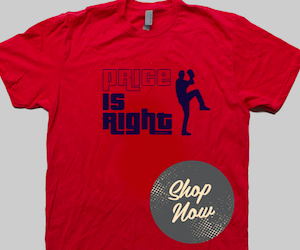 The great right-hander Pedro Martinez came in to relief Lowe. Pedro is one of the greatest pitchers of his generation, but the Yankees always managed to get in his nerves. As soon as Martinez stepped into the diamond, Yankee fans began shouting "Who's your daddy?" making reference to something that Martinez said few weeks before. It doesn't matter if you are Sandy Koufax or Cy Young, if 60,000 people began chanting "Who's your daddy?" you'll allow a few runs, and Pedro had only one day rest. Eventually, the Red Sox ace got out of the jam and only allowed two runs. Mike Timlin came in to relief Martinez and the house that Ruth built suddenly felt like Fenway Park when loud chants of "Let's go Red Sox!" where heard all over the place. Goodbye Yankees, the Red Sox are few outs away of being American League Champions. Alan Embree finished the game, when Ruben Sierra hitted a ground ball to Pokey Reese and the second baseman threw to first base. The Red Sox won by 10-3 and Babe Ruth demon was finally exorcised from his former team and in the house that he built. Rumour has it that Gate of Heaven Cemetery, where Ruth's grave is, suffered from a little earthquake when the final out was recorded. Where were you the night the Red Sox made history? 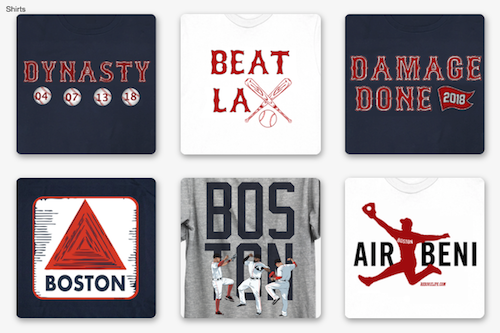 Which Red Sox Championship team is your favorite? Leave your comments below.